LOVE Norway at Epcot. Nice shot! This strangely makes me sad. I remember the play area and now it looks a bit forgotten. Hurray for Norway! I love seeing the viking ship! I always thought it looked like they ran aground hopped out and went in for a some food and ale or whatever it is Vikings drink. Great pic! 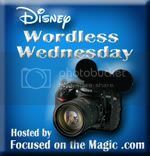 Good job going wordless! Awesome shot! Only you can pull off wordless. Love Norway at EPCOT!